Steve Mann was recognized as "The Father of The Wearable Computer", IEEE ISSCC, Feb. 7th, 2000. "Steve Mann ... brought with him an idea... And when he arrived here a lot of people sort of said wow this is very interesting... I think it's probably one of the best examples we have of where somebody brought with them an extraordinarily interesting seed, and then ... it grew, and there are many people now, so called cyborgs in the Media Lab and people working on wearable computers all over the place." "Steve Mann is the perfect example of someone... who persisted in his vision and ended up founding a new discipline." Since early childhood, as an amateur scientist and inventor, Mann has been designing, building, and wearing computer systems, wearable vision systems, and something he called ``Digital Eye Glass''. He originally built it as a seeing aid for electric arc welding (i.e. as a smart welder's glass; see "Quantigraphic camera promises HDR eyesight from Father of AR") and later used it in his everyday life, being called "the father of the wearable computer", February 8th, 2000 (IEEE ISSCC2000). 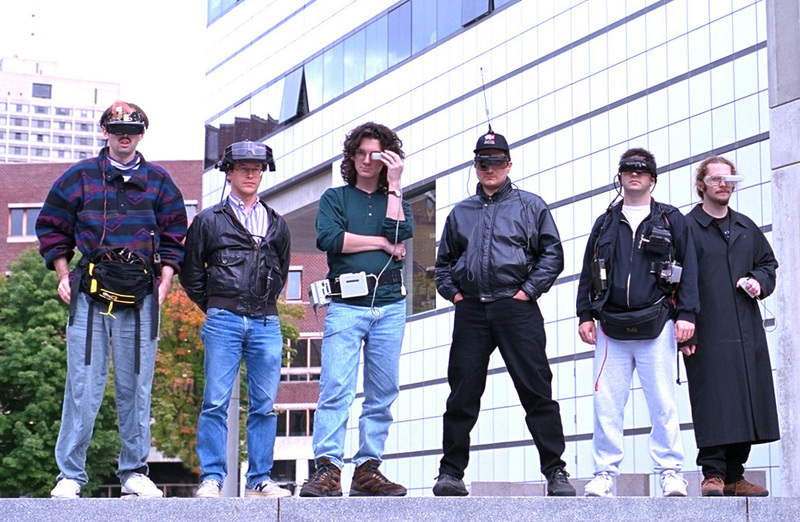 wearable augmented reality computer system [Steve Mann, "Wavelets and Chirplets: Time-Frequency Perspectives", pages: book cover + 99-128, in "Advances in Machine Vision: Strategies and Applications", Colin Archibald and Emil Petriu, editors, 1992]. At that time the Director of the MIT Media Laboratory was Nicholas Negroponte. "Steve Mann was, uh, building wearable computers in high school, and I think its [a] perfectly good example, that here's a young man that brought with him an idea... And when he arrived here a lot of people sort of said wow this is very interesting... I think it's probably one of the best examples we have of where somebody brought with them an extraordinarily interesting seed, and then it sort of, you know, it grew, and there are many people now, so called cyborgs in the Media Lab and people working on wearable computers all over the place." "Steve Mann is the perfect example of someone deemed to be on the lunatic fringe, but who persisted in his vision and ended up founding a new discipline."